A perfect one-pot meal of eggs cooked in spiced tomato sauce. Washington: The classic Tunisian dish shakshuka is a humble yet satisfying one-pot meal, usually consisting of eggs cooked in a long-simmered, spiced tomato and pepper sauce. For the greens, you can settle on savoury Swiss chard and easy-to-prep baby spinach. Cook a cup of the sliced chard stems (any more and their vegetal flavours overwhelmed the dish) with onion to create an aromatic base. Eschew the traditional strong flavours of cumin and paprika in favour of coriander and mild Aleppo pepper their citrus notes allows the greens’ flavours to stay centre stage. The roomy Dutch oven allows you to wilt a large volume of raw greens easily. Blend a cup of the greens mixture with broth to give the sauce a creamy, cohesive texture, and then add frozen peas for contrasting pops of sweetness. To finish, add poached eight eggs directly in the sauce, covering the pot to contain the heat for efficient, even cooking. 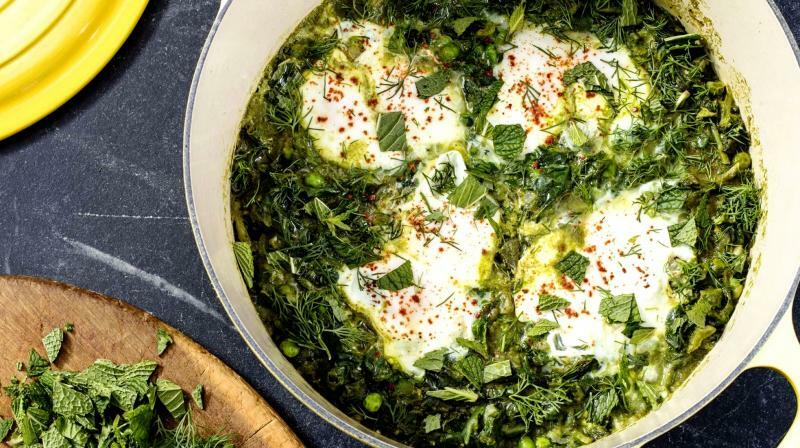 Serve the green shakshuka with a sprinkling of bright herbs and salty, creamy feta cheese. Slice chard stems thin to yield 1 cup; discard remaining stems or reserve for another use. Heat 2 tablespoon oil in Dutch oven over medium heat until shimmering. Add chard stems, onion, and 3/4 teaspoon salt and cook until vegetables are softened and lightly browned, 5 to 7 minutes. Stir in garlic and coriander and cook until fragrant, about 1 minute. Make 4 shallow indentations (about 2 inches wide) in surface of greens using back of spoon. Crack 2 eggs into each indentation, sprinkle with Aleppo pepper, and season with salt. Cover and cook over medium, low heat until edges of egg whites are just set, 5 to 10 minutes. Off heat, let sit, covered, until whites are fully set and yolks are still runny, 2 to 4 minutes.